Our oil saver rubber replacements are made from a special blend of rubber and abrasion-resistant compounds that have a stronger resistance to damage and wear from oil, gas, mud, dirt and other contaminants. This compound allows for oil and other types of fluids to move in and out of the well to help prevent contamination as well as providing a longer product life. 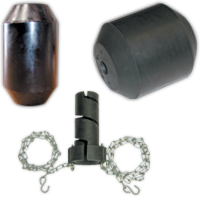 Our oil saver replacement rubbers are specifically designed to help form a reliable seal around the wire line as you retrieve the swab string from the casing or tubing of your well. This means our wire line cable wipers provide sufficient sealing and wiping action to help keep rig floors cleaner — and job sites safer. Global Elastomeric Products can provide the best oil saver rubber solution for your unique oilfield applications. We offer a wide selection of oil saver line wiper products that have proven themselves in even the most challenging operating conditions. In addition to our standard oil saver rubber product lines, we can also create a custom design if needed. Our staff includes an experienced in-house design engineer who can develop your custom design with speed and efficiency. We also provide a level of quality that is second to none in our industry. We're an ISO 9001:2008-registered company that implements the most stringent quality control processes. This ensures that you'll always receive a product that is free of imperfections and defects. No matter the size or scope of your project, you'll receive a high-quality result that will exceed your expectations. At Global Elastomeric Products, Inc., we place as much emphasis on our manufacturing capabilities as we do on our customer service. You can always be assured of getting high-quality products matched with great service and attention to your needs. In addition, because we’re a privately-held American business, you can also rest easy knowing the products you order from us are 100 percent made in the USA. Contact us to learn more about our oil saver rubber solutions and receive a no-obligation price quote today. E7GA0516B545 STRIPPER,OIL SAVER GA 5/16"
E7GA0916B545 STRIPPER,OIL SAVER GA 9/16"